Turckheim, France. Less than a mile from the Alsatian village that I have called home for the past two Septembers is a sign that says Vendangeurs, or grape pickers. It’s a warning to motorists on the Route des Vins to be cautious of the harvest in progress. Along the 105-mile, two-lane road, which weaves through this wine-producing region, grape pickers creep up and down the neatly planted rows, snipping the vines, heavy with fruit. Most of the six varieties of white grapes raised here are household names in North America: Gewürztraminer, muscat, pinot blanc, pinot gris, Riesling and Sylvaner. Above the doorway and running up the side of the mustard-yellow gingerbread-style house that my husband and I have rented is an arbor of pinot noir grapes – used to produce the only red wine in Alsace. In a welcoming gesture, Séverine, our landlady, clipped some for us upon our arrival. 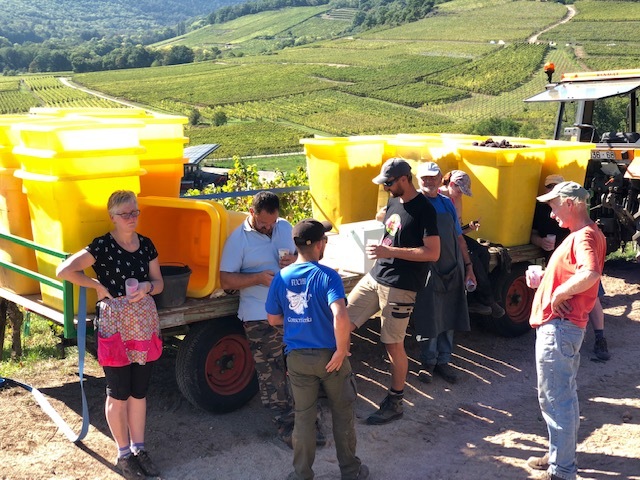 The harvest, which usually begins in early September and lasts about five weeks, had started at least two weeks earlier this year because of an unusually hot and dry summer. Grapes not picked in time turn to raisins on the vine. Picking grapes is tough manual labor, and has been for centuries. The Musée du Vignoble et des Vins d’Alsace, in nearby Kientzheim, documents winemaking through the ages, with rugged, old hand-built equipment and tools on display. Today, even with modern conveyances and winepresses, the harvesting is still done by hand, often in the blazing sun. Grapes are fragile, and machines can’t replicate the picker’s gentle touch. Lunch, as help-wanted flyers posted in various villages indicate, may be part of their compensation. In his classic book, The Food of France, Waverly Root writes about a soupe des vendanges, served to the grape-picking crews in Bordeaux – another wine-producing region, south and west of here. From his description, it sounds like a local variation of pot-au-feu, made with beef, veal and vegetables. But when I asked about soupe des vendanges at a nearby butcher shop that I frequent, the woman behind the counter looked at me as if I had landed from another planet. Root emphasizes that French cuisine varies by region. Clearly this was one example of that. In Alsace, the German influence is pronounced and profound. The area has changed hands violently four times during the past century. Most of the villages, including the one where we are living, retain their German names. At what has become my go-to butcher shop, Boucherie Charcuterie Sigmann, in the neighboring village of Ingersheim (44 rue de la République), pork products dominate the display case. There are many varieties of link sausages; smoked ham and lard; and a precooked, spreadable sausage sold in a casing. This last category, called tartiner in French, is one of the things that wine producers feed their crews. Slathered on a fresh baguette, it’s nutritious, inexpensive and sticks to your ribs. A smoky, peppery variety, known as mett, became my favorite picnic food. Just one, three-finger length of it, carved off a larger piece, cost less than $1 and lasted for several meals. 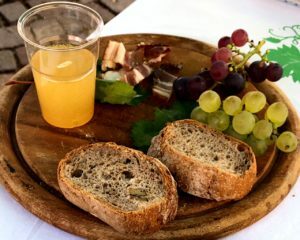 One Sunday, during a visit to the ultra-touristy but picture-perfect village of Riquewihr, I sampled another typical vendanguer’s refreshment: a plate of smoked bacon, grapes and nut bread. This simple repast was being sold to benefit the men’s choir and cost €5, or $5.85, including a cup of vin nouveau, or new wine, made from pinot blanc grapes. Vin nouveau is the super-sweet, slightly fermented liquid that is the first product of the harvest as the grapes are pressed. It is considered a delicacy and is available only during the vendanges. It’s a festive time of the year here, with fêtes des vendanges, or celebrations of the harvest, in wine-producing villages, and food stores offering seasonal concoctions. The Arnaud et Fred boulangerie-pâtisserie, in Ammerschwihr (16 Grand Rue), sells a tarte des vendanges – a buttery shortbread with custard into which pinot blanc and pinor noir grapes have been pressed (€2.30, or about $2.70, per slice). Watch out for the pits. Boucherie Pfertzel, in St. Hippoltye (51 Route du Vins), offers a saucisse spéciale vendanges that I tried once and then dreamt about until I could go back for more. Chunky with veal, pork and white raisins (a stand-in for the grapes), and seasoned with garlic and fresh dill, the version I bought is cooked in white wine and eaten cold (€17.20, or $20, per kilo). If you would rather cook it yourself and eat it hot, Pfertzel also sells a link version that can be boiled in water. 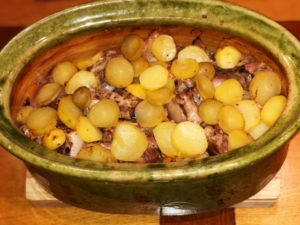 After a day of exertion, the evening meal, then and now, might be baeckeoffe – a hearty peasant stew that feeds a crowd, during the vendanges, on Christmas and on other special occasions in Alsace. It’s but one example of how, with seasoning and slow cooking, the French turn inexpensive cuts of meat into delicious meals. Traditionally, baeckeoffe (pronounced “bake off”) is made with equal parts of cubed pork, beef and lamb. The first step is to marinate it overnight with onions, leeks, carrots and herbs, and an entire bottle of white wine. (Why not? It’s plentiful and inexpensive.) The next day you layer these ingredients with slices of potatoes and cook the stew in a ceramic, oval-shaped casserole designated for the purpose. In the days before many French homes had ovens, families would drop off this plat rustique at the local boulangerie, or bakery, and pick it up several hours later when it was done. The baker would press a rope of dough over the pot lid, which formed a hermetic seal as the dish cooked. The word baeckeoffe means baker’s oven in Alsatian. According to local lore, making baeckeoffe was a washday ritual: Women would deposit the dish at the baker en route to do the laundry (for example, at a centrally located outdoor washtub), and retrieve it several hours later on the way home for lunch. Even now that many homes have ovens, running water (and washing machines), locals cling to other aspects of the baeckeoffe ritual. This includes using the special ceramic casserole and sealing the cover with a rope of dough. Since this dish is traditionally prepared in the home and takes a long time to cook, it’s rare to find it on restaurant menus, especially if you are looking to avoid tourist establishments. When I asked our host, Séverine, to recommend an authentic place to eat baeckeoffe, she was at a loss. I subsequently found it on the menu at the Winstub at Le Chambard, a hotel and restaurant in Kaysersberg owned by Michelin-star chef Olivier Nasti. There, baeckeoffe costs €24 (about $28) per person and must be ordered 48 hours in advance. One can also buy vacuum-packed portions of prepared baeckeoffe at Pfertzel for €8.60 (about $10) and reheat it at home. Séverine suggested what was for me a more attractive alternative: She would share her recipe and lend me her baeckeoffe terrine. 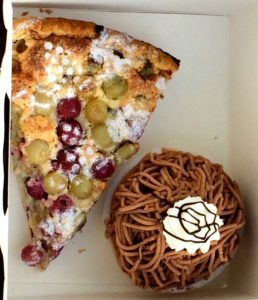 Vous pourrez ainsi prendre plaisir à cuisiner votre baeckeoffe, she wrote in an e-mail. (That way you can have the pleasure of cooking your own baeckeoffe.) Pleasure, indeed. We came home the next day to find a handmade pottery casserole about the size of my turkey roaster, nearly twice as deep and weighing at least four pounds, sitting on top of the stove. As I conducted this informal research, flipping when necessary to the Collins French Dictionary app on my iPhone, there were two ingredients that gave me pause. One was unmistakably a pig’s foot. Though I wasn’t wild about this idea, it did not surprise me. I had seen enough pigs’ feet sold at French butcher shops (and in New York’s Chinatown) to know that trotters add flavor and thicken the sauce. But what about the last item on the list: une petite queue de porc? Could this really mean a little pig tail? I fervently (and naively) hoped otherwise. “Is this an idiom?” I asked the butcher, revealing my ignorance to her apparent amusement. She kept a poker face as she opened a refrigerator drawer, reached in, and, looking me straight in the eye, waived what couldn’t be mistaken for anything but the real deal. For a moment I wondered whether I was taking this project to what some might consider, um, extremities. Still, this additional source of gelatin seemed required for authenticity. And if I was really going to eat like a vendangeur, I would be cheating if I omitted it. So I left my order with the butcher for pickup two days later. She had talked me out of adding veal – a meat that was included in one of the recipes I considered. It would make my baeckeoffe too dry, she said. And besides, that’s not how it’s done. Again and again the locals I consulted in markets, stores and museums (I speak halting French and am not shy) offered words of encouragement. Food is a great conversation starter. So I routinely ask strangers ahead of me in line how they plan to prepare the ingredients that they’re ordering. Their answers are a continuing source of education – and amusement. When it comes to food in France, there is no shortage of self-appointed experts. On the subject of baeckeoffe, their opinion was unanimous. Loosely translated, these sources told me, “You absolutely can’t screw it up.” Whether you are out doing laundry, picking grapes (or working on an article about making baeckeoffe), you can put it in the oven and, for roughly three hours, forget about it. And so I did. My butcher’s bill came to roughly what it would cost for one portion of baeckeoffe at the Winstub at Le Chambard. For no extra charge, and at my request, the butcher cut all the meat into the right-size chunks. My prep time, mostly spent washing, peeling and slicing vegetables, was roughly one hour, the night before. It took another hour the following day to peel and slice the potatoes, layer the ingredients in the terrine and make the dough rope to seal it. The aroma, as it cooked, was tantalizing (did I really have to wait three hours? ); the result stupendous. My baeckeoffe could have fed a small army of grape pickers. Instead, we froze some and savored the rest as leftovers. It was certainly a kick borrowing Séverine’s authentic terrine, and my stew had all the flavors of France, but I see no reason why the kitchen-tested recipe below can’t be replicated in a five-quart Dutch oven back home in Brooklyn, New York. Séverine’s recipe indicated that the dough rope was “optional but produced a nice effect.” In the future I would skip it, among other things, so that I could check the progress of the stew, which probably could have been removed from the oven 30 minutes earlier. And those who are squeamish about the pork extremities (or can’t easily obtain them) might find it a fair compromise to leave them out. 1. Place the leeks, carrots, onions, garlic and spices in a dish large enough to hold them together with the meats. (This should not be the casserole in which you plan to cook these ingredients the following day.) Season the meat with salt and pepper and arrange it on top of the bed of vegetables. 2. Pour a bottle of white wine over the meat and vegetables, cover with plastic wrap and refrigerate overnight, or up to 24 hours. 3. When you are ready to cook the baeckeoffe, arrange some of the onions on the bottom of the terrine, followed by alternating layers of potatoes, meat and the other vegetables, concluding with a layer of potatoes. 4. Preheat oven to 350 degrees Fahrenheit. Pour the liquid in which the ingredients have been marinating into the casserole and cover. Bake 2 ½ to 3 hours, until meat is tender when pricked with a fork. Eat with a salad, crusty bread and a dollop of mustard on the side. What a delightful peek into the food and culture of Alsace! I almost smelled the aroma of the Baeckeoffe. Thanks, Irene! I froze the leftovers and brought them with us to our latest digs, in the Dordogne. How delightful to discover another person blogging about Alsace! I’m just about to head off there with my children to live in les Vosges for three months (around 50 min down the road from where you were). So your boucherie suggestions – with links! – are really handy. Given we’ll be there in winter, this hearty stew sounds ideal. Hoping my results are as good as yours. Thanks for sharing! Have a wonderful time and enjoy the famous Christmas markets! I have never been in Alsace at that time of year, but it is supposed to be beautiful.